The map above isn't the greatest -- it doesn't, for instance, include Alaska and Hawaii -- but it conveys the point. [Plus, I've yet to see a map on this.] The dark-shaded districts are the ones where Obama or McCain and a Democrat or Republican House candidate, respectively, won the district. In the lightly-shaded districts, McCain and Obama won while a House candidate of the opposite party carried the congressional race. Now, it should be noted that some of the smaller suburban/urban districts don't show up as well as those districts larger in area. However, below you'll see the list of all 83 districts where the vote for president and House were split between the two parties. These seats, or at the very least a fraction of them, are where the battlegrounds will be in next year's midterms. House seats aside, under the electoral vote allocation system used by Maine and Nebraska, the winner of a congressional district receives one electoral vote and the overall statewide winner wins the two electoral votes that represent a state's two senators. 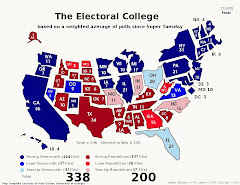 Adding the 56 electoral votes from the 28 states Obama won (plus the three electoral votes from the District of Columbia), the president's electoral vote total would have equaled 301. McCain, meanwhile, would have started off with more electoral votes from congressional districts alone to have suprassed his total under the current electoral college system (173 electoral votes). By adding in the 44 electoral votes for overall statewide victories would have brought the Arizona senator's total to 237 electoral votes. The bottom line is that the Democrats gained in 2008 from in the system as it is set up currently. And that is strange considering the party has been behind the eight ball in terms of the electoral college for the better part of a generation. If the system shifted to a completely Maine/Nebraska set up that would tilt things toward the GOP a little more. In the process, though, there would be a move from focusing on a handful of swing states to a finite number of swing districts. And despite the fact that a split between the presidential and House votes in a district does not make for a competitive presidential race in that district necessarily, we are talking about 83 such districts in 2008 from 37 states. From a strategic standpoint, it would be fun to see the system operate under this method for one election cycle. This is a very interesting and useful exercise. But I think it is inaccurate to say "The bottom line is that the Democrats gained in 2008 from the system as it is set up currently." If we had a different system, the campaigns would have been different. And that means the votes would have been different. Campaigning in Ohio, Pennsylvania and Florida would have fallen off, and resources would have been redirected in hard-to-predict ways. 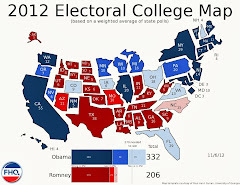 More to the point, there is no advantage to having more or fewer electoral college votes. Obama would have won under either system. What probably is true is that any system that disaggregates votes (as a a ME/NE system does relative to the EC) will tend to more closely reflect the popular vote. The EC magnifies the result. But the degree of that distortion is not a good measure of the probability of victory. I agree Hans that it is never as easy as saying, "If the rules were different, this is how it would have been." My point with that sentence and the one that followed was to put things in a bit of a historical perspective. That the Democrats came out on top in 2008 (without an incumbent running) was something of a departure from the presidential elections of the last generation (save, perhaps, Bill Clinton's win in 1992). Sure things would have been different. That's why I closed by saying it would be great to see this system play out in one election to see how things would be different. That said, I'm sure we could potentially model the level of attention on the district level and make a projection of some sort. I just don't have access to that data. Fair enough. And I don't mean to take away from what is still an interesting exercise. But I don't think you can conclude that the system benefitted the Democrats. It gave them a larger number of EC votes than they would have had under the other system, but that's an artifact of the counting scheme. The victory is not "closer" just because we use a different metric. And if the victory were no less close, then it's hard to say there was a "benefit." Here's another way to think about it. Supposing we always counted by CD. The variance in EC votes across all elections would be smaller (presumably). Now, would Obama's victory be bigger or smaller, relative to that variance, than in the current system? I suspect it wouldn't be smaller (closer), but I really don't know. Short of something like that, we can't really say. The real metric would be probability of victory, but we both agree that involves a lot of unmeasurables. I think this system would cause Democratic Presidential candidates to completely abandon rural areas, and Republicans to completely abandon the cities, reducing the power of both constituencies and leaving all the decisions up to the suburbs. In 2008, McCain needed to avoid completely alienating, say, Gary, Indiana, and Obama needed to pull some votes from rural Virginia. That would cease to be true. Because of racial gerrymandering, a congressional district system would systematically advantage the Republicans. Heck, even before the 1992 majority/minority districts, Ford would have defeated Carter in 76 even though he lost the national popular vote by 2 points. I think we're arguing along slightly different lines here. I went back and found the point of contention. I did not mean to say that the Democrats gained from the system. That should have said in, as in, "The Democrats gained within the current system for the first time in a while." To your other point, Michael Miller and Peter Francia are working on a paper that looks at this all the way back to 1968. Michael said in a post to the Political Methodology listserv last fall that they'd have something out by this spring. We'll have to see what they're doing and how they are approaching those unmeasurables. It seems like you, Rob and I had this same, yet mapless, discussion sometime last fall, Scott. And the thing with majority/minority districts, Arbitrista, is that the courts have completely ruled out retrogression in any of those districts. They are institutionalized at this point, which means Democrats wouldn't necessarily have to play to those districts but would have to seek other ones. I don't know, something about a 435 district strategy is more appealing to me than a mere 50 state strategy. But I'm not one to mind a change in the rules and the complexity being upped. While I think people are raising valid points about changing the areas that got the most attention during campaigns and certain parties abandoning certain areas, I think the biggest change that we'd see if the whole country used this system is that gerrymandering would become much more blatant, with the consequences that redistricting battles would become far more intense and instances of mid-census redistricting (like Texas did in 2003) would become routine. There's already a small chorus of voices calling for major reform to how districts are selected (leaving the decision to nonpartisan groups or even computers, larger districts with multiple representatives, etc); I imagine it wouldn't take too long (a generation or so) for this chorus to get very big and very loud if we moved to such a system. Unintended consequences? In American politics? Surely not! This is an excellent point actually. Redistricting would receive a ton more scrutiny under a Maine/Nebraska electoral college system. And since you brought up the Texas situation, I have to add one historical caveat. It was only during the 20th century that this midstream redistricting began to be frowned upon. Texas-esque redistricting was actually quite common in the 19th century. If partisan control of a legislature changed hands, a redrawing of the lines soon followed. There's more in this AJPS article by UGA's own Jamie Carson. But you're right, SD. If the Texas example becomes rule rather than exception, the discontent will rise quickly. Thanks for the info, Josh. I knew there were cases where states went decades without redistricting, but I didn't know that frequent mid-census redistricting had so much precedent. Not surprised, though...I know better than to think that the levels of partisanship we see today are anything new. Personally, I was surprised that no Democratic legislatures retaliated after what Texas did. Or were there simply no states in a position to do what Texas did, but in the other direction? One error I saw- Obama didn't care the Kansas 2nd district- he only carried the KS-3. Good catch Jason. I thought I got all of those. The map I started with was a partisan breakdown of the 110th Congress. Obviously, KS-2 was colored a bit differently after 2006 than after 2008. Thanks. I'll make that correction and repost the map. I seem to recall New Mexico threatening to redistrict in the midst of the Texas situation. That redraw would have favored Democrats. Yep. CSM backs me up on that New Mexico recollection. KS-2 fixed on the map. The major shortcoming of the current system of electing the President is that presidential candidates concentrate their attention on a handful of closely divided "battleground" states. 98% of the 2008 campaign events involving a presidential or vice-presidential candidate occurred in just 15 closely divided “battleground” states. Over half (57%) of the events were in just four states (Ohio, Florida, Pennsylvania and Virginia). Similarly, 98% of ad spending took place in these 15 “battleground” states. Similarly, in 2004, candidates concentrated over two-thirds of their money and campaign visits in five states and over 99% of their money in 16 states. Two-thirds of the states and people have been merely spectators to the presidential elections. Candidates have no reason to poll, visit, advertise, organize, campaign, or worry about the voter concerns in states where they are safely ahead or hopelessly behind. The reason for this is the winner-take-all rule enacted by 48 states, under which all of a state's electoral votes are awarded to the candidate who gets the most votes in each separate state. Another shortcoming of the current system is that a candidate can win the Presidency without winning the most popular votes nationwide. This has occurred in one of every 14 presidential elections. In the past six decades, there have been six presidential elections in which a shift of a relatively small number of votes in one or two states would have elected (and, of course, in 2000, did elect) a presidential candidate who lost the popular vote nationwide. The National Popular Vote bill would guarantee the Presidency to the candidate who receives the most popular votes in all 50 states (and DC). Every vote would be politically relevant and equal in presidential elections. The bill would take effect only when enacted, in identical form, by states possessing a majority of the electoral votes—that is, enough electoral votes to elect a President (270 of 538). When the bill comes into effect, all the electoral votes from those states would be awarded to the presidential candidate who receives the most popular votes in all 50 states (and DC). The Constitution gives every state the power to allocate its electoral votes for president, as well as to change state law on how those votes are awarded. The bill is currently endorsed by 1,246 state legislators — 460 sponsors (in 48 states) and an additional 786 legislators who have cast recorded votes in favor of the bill. The National Popular Vote bill has been endorsed by the New York Times, Chicago Sun-Times, Minneapolis Star-Tribune, Los Angeles Times, Boston Globe, Hartford Courant, Miami Herald, Sarasota Herald Tribune, Sacramento Bee, The Tennessean, Fayetteville Observer, Anderson Herald Bulletin, Wichita Falls Times, The Columbian, and other newspapers. The bill has been endorsed by Common Cause, Fair Vote, and numerous other organizations. In Gallup polls since 1944, only about 20% of the public has supported the current system of awarding all of a state’s electoral votes to the presidential candidate who receives the most votes in each separate state (with about 70% opposed and about 10% undecided). The recent Washington Post, Kaiser Family Foundation, and Harvard University poll shows 72% support for direct nationwide election of the President. This national result is similar to recent polls in closely divided battleground states: Colorado — 68%, Iowa — 75%, Michigan — 73%, Missouri — 70%, New Hampshire — 69%, Nevada — 72%, New Mexico — 76%, North Carolina — 74%, Ohio — 70%, Pennsylvania — 78%, Virginia — 74%, and Wisconsin — 71%; in smaller states (3 to 5 electoral votes): Delaware — 75%, Maine — 71%, Nebraska — 74%, New Hampshire — 69%, Nevada — 72%, New Mexico — 76%, Rhode Island — 74%, and Vermont — 75%; in Southern and border states: Arkansas —80%, Kentucky — 80%, Mississippi —77%, Missouri — 70%, North Carolina — 74%, and Virginia — 74%; and in other states polled: California — 70%, Connecticut — 73% , Massachusetts — 73%, New York — 79%, and Washington — 77%. The National Popular Vote bill has passed 23 state legislative chambers, including one house in Arkansas, Colorado, Maine, Michigan, New Mexico, North Carolina, and Washington, and both houses in California, Hawaii, Illinois, New Jersey, Maryland, Massachusetts, Rhode Island, and Vermont. The bill has been enacted by Hawaii, Illinois, New Jersey, and Maryland. These four states possess 50 electoral votes — 19% of the 270 necessary to bring the law into effect. 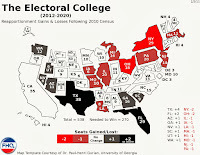 Dividing a state's electoral votes by congressional district would magnify the worst features of our antiquated Electoral College system of electing the President. What the country needs is a national popular vote to make every person's vote equally important to presidential campaigns. If the district approach were used nationally, it would less be less fair and accurately reflect the will of the people than the current system. In 2004, Bush won 50.7% of the popular vote, but 59% of the districts. Although Bush lost the national popular vote in 2000, he won 55% of the country's congressional districts. The district approach would not cause presidential candidates to campaign in a particular state or focus the candidates' attention to issues of concern to the state. Under the winner-take-all rule (whether applied to either districts or states), candidates have no reason to campaign in districts or states where they are comfortably ahead or hopelessly behind. In North Carolina, for example, there have been only 2 districts the 13th with a 5% spread and the 2nd with an 8% spread) where the presidential race is competitive. In California, the presidential race has been competitive in only 3 of the state's 53 districts. Nationwide, there have been only 55 "battleground" districts that are competitive in presidential elections. 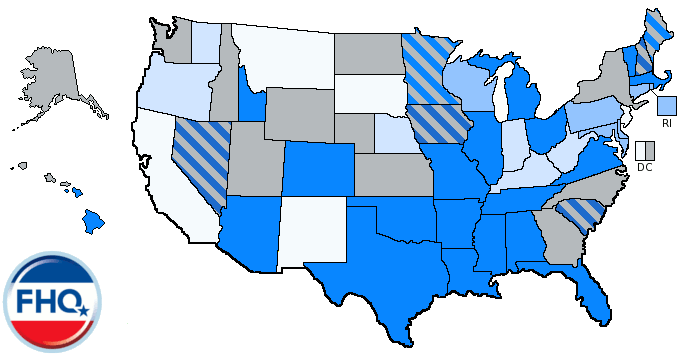 Under the present deplorable state-level winner-take-all system, two-thirds of the states (including North Carolina and California and Texas) are ignored in presidential elections; however, seven-eighths of the nation's congressional districts could be ignored if a district-level winner-take-all system were used nationally. When presidential candidates campaign to win the electoral votes of closely divided battleground states, such as in Ohio and Florida, the big cities in those battleground states do not receive all the attention, much less control the outcome. Cleveland and Miami certainly did not receive all the attention or control the outcome in Ohio and Florida in 2000 and 2004. Under a national popular vote, every vote is equally important politically. There is nothing special about a vote cast in a big city. When every vote is equal, candidates of both parties know that they must seek out voters in small, medium, and large towns throughout the state in order to win the state. A vote cast in a big city is no more valuable than a vote cast in a small town or rural area. Another way to look at this is that there are approximately 300 million Americans. The population of the top five cities (New York, Los Angeles, Chicago, Houston and Philadelphia) is only 6% of the population of the United States and the population of the top 50 cities is only 19% of the population of the United States. Even if one makes the far-fetched assumption that a candidate won 100% of the votes in the nation’s top five cities, he would only have won 6% of the national vote. Further evidence of the way a nationwide presidential campaign would be run comes from the way that national advertisers conduct nationwide sales campaigns. National advertisers seek out customers in small, medium, and large towns of every small, medium, and large state. National advertisers do not advertise only in big cities. Instead, they go after every single possible customer, regardless of where the customer is located. National advertisers do not write off Indiana or Illinois merely because their competitor has an 8% lead in sales in those states. And, a national advertiser with an 8%-edge over its competitor does not stop trying to make additional sales in Indiana or Illinois merely because they are in the lead. Keep in mind that the main media at the moment, namely TV, costs much more per impression in big cities than in smaller towns and rural area. So, if you just looked at TV, candidates get more bang for the buck in smaller towns and rural areas. For example, in California, candidates for governor or U.S. Senate don't campaign just in Los Angeles and San Francisco, and those places don't control the outcome (otherwise California wouldn't have recently had Republican governors Reagan, Dukemejian, Wilson, and Schwarzenegger). A vote in rural Alpine county is just an important as a vote in Los Angeles. If the National Popular Vote bill were to become law, it would not change the need for candidates to build a winning coalition across demographics. Any candidate who yielded, for example, the 21% of Americans who live in rural areas in favor of a "big city" approach would not likely win the national popular vote. Candidates would still have to appeal to a broad range of demographics, and perhaps even more so, because the election wouldn't be capable of coming down to just one demographic, such as voters in Ohio. The Asian American Action Fund, Jewish Alliance for Law and Social Action, NAACP, National Latino Congreso, and National Black Caucus of State Legislators endorse a national popular vote for president. The influence of minority voters has decreased tremendously as the number of battleground states dwindles. For example, in 1976, 73% of blacks lived in battleground states. In 2004, that proportion fell to a mere 17%. Battleground states are the only states that matter in presidential elections. Campaigns are tailored to address the issues that matter to voters in these states. Safe red and blue states are considered a waste of time, money and energy to candidates. These "spectator" states receive no campaign attention, visits or ads. Their concerns are utterly ignored. mvymvy, not to be rude or anything, but if I wanted SPAM I'd have gone to the grocery store. Was there a single original sentence in your SIX posts? We were not discussing NPV. We were discussing what the ramifications of a nationwide switch to the NE/ME system. While I have no problem with natural topic drift, we can do without attempts to completely derail a conversation by posting screen after screen after screen after screen after screen of material that is regurgitated from elsewhere and only tangentially related to the current conversation. b) concern that gerrymandering three districts wasn't worth it, particularly if it emboldened other Republican-controlled state legislatures into doing the same thing Texas did, with the result that a gerrymander by New Mexico might actually strengthen the Republicans when all was said and done. Normally, I'd delete this material from mvymvy, but my policy is to let "relevant" spam be posted once. After that it is simply tossed. But six messages is a lot. I don't know why New Mexico didn't follow through with the redistricting. I'm pretty sure that a bill was at least introduced, and it is likely that a combination of the issues you mentioned played a role. If they were retaliating against Texas, it was going to be difficult for them to match the number of newly Republican districts created in Texas with only three districts to work with. But the Democrats, angry or not, had pretty healthy margins in both chambers (24-18 in the Senate, 42-28 in the House), so they could have gotten it done depending on how the governor (Richardson) felt about the idea. If he was cool toward it, that may have been enough to kill it. I don't know. I'd also add that they perhaps didn't want to help cement a dangerous precedent. Texas doing it is one thing. Texas doing it, followed by New Mexico, followed by who knows who else is another altogether. I tried to count the districts with Democratic and Republican leans (by PVI) a while ago, but there are just too many. However, about 25 more districts have Republican leans than Democratic leans, which probably means that a Democrat would need to win the popular vote by about 1-2 points to have an equal chance of winning in a district-based system. Also, why isn't my district (NY-3) listed under those that split their vote? The district (on Long Island) is colored blue on the map, but last I checked we have a Republican congressman. If this is no longer the case, please tell the Democrats in my district; as of yesterday's meeting they were quite unhappy about that situation. Oh, I see why NY-3 wasn't listed among vote-splitting districts. SwingStateProject doesn't have the presidential results for New York districts 2-5 - the only districts in the country it doesn't. 2, 4, and 5 are D+8, D+9, and D+18 respectively and have Democratic representatives. NY-3 is D+2, and considering Obama's margin of victory it surely went Democratic. So NY-3 can be added to the list (unless, of course, you copied it from elsewhere). Oh, and how do you define strong/lean districts? ID-2 (is that ID-2 that's in light pink? I forget which Idaho district is which), for example, went 61% for McCain and is on the map as Republican lean, for example. Meanwhile, 2 of Nevada's districts are shown as Strong McCain, while none of Nevada's districts favored McCain. And LA-5 went for McCain with 62% of the vote, not Obama as the map shows. GA-3 is also wrong on the map; Lynn Westmoreland's district most certainly did not go for Obama! NY-3 had a couple of issues. It is one of those small districts around the city that gets swallowed up by the unfortunately blue borders. I can't tell what it is. Yes, NY-3 isn't on the list because SSP didn't have the information on it. That should probably have been labeled split and non-split, but for some reason that didn't come to me when I was doing the map yesterday. In my head it was, "District that Voted for Obama and a Republican for House" and vice versa for McCain. And that wasn't going to fit in that area. So, I leaned on the past (admittedly flawed) language. On these, I have no idea. I got the map from National Atlas and in their area for map-making, they have a layer for partisanship in the 110th Congress. I updated it for the 111th (give or take a KS-2 or so), but that shouldn't have been a problem for either of those districts, as neither flipped in 2008. Thanks for bringing those to my attention. I'll fix them and repost. GA-3 and LA-5 have been fixed. Both had been mistakenly labeled as Obama wins when they were not. Zoomed in and used MS paint on NY-3 (a dense suburban district, so it's not tiny but certainly small) - it's light blue, which is correct. Just noticed NM-1 is wrong; it now has a Democratic representative and went 60-40 Obama. Didn't check all the districts, but 432 out of 435 ain't bad. And it doesn't make it any less of an interesting topic. It's impossible to come up with a perfect system. While I assume most would agree that the Electoral College system is flawed, the combination of gerrymandering and the fact that Dem districts tend to be more tightly packed with Democrats than Republican districts w/Republicans makes this flawed too. And national popular vote has its own problems which we've discussed. Probably the "best" system (not that anything is objectively "best") involves some complicated mathematical formula that takes into account all these factors — but who wants a formula they don't understand to determine who will run the country? The other two (GA-3 and LA-5) were not totally my fault, but this one is. [And I was all set to blame National Atlas.] I missed this one when I was updating for the 2006-2008 seat swings. NM-1 and KS-2 are not ones I should have missed. Even though my focus was almost totally on the presidential race, I still had read enough about each not to have missed them. So that's 431 out of 435 (...and dropping apparently.). Nah, I love hypotheticals like this (...in case you hadn't noticed). I hope to have the Indiana primary attention projections up tomorrow sometime. I finally got to work on that a little today. That snow-related power outage really set me back. When you close your post by saying "it would be fun to see the system operate under this method for one election cycle," there is every reason for one to point out the obvious problems that would bring, and how we could do much better. What about Nevada 1 and 3? 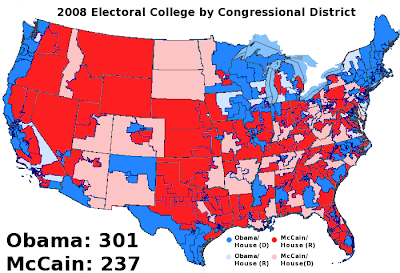 Obama and Dem congressmen won both, yet they're dark red on that map. And NV-2 was 49-49 in the presidential race - I don't know who had more votes. Sorry to pick on you — I appreciate your taking the time to work on that map. Nope. I don't take it the wrong way. NV-1 is the small one, and thus hard to see, but it is properly shaded. NV-2 is correct. McCain won by 88 votes. NV-3 is another swing I missed. Fix on the way. There's a little speck of red in Southwest Connecticut (Is that supposed to be CT-4, Chris Shays's old district? ), but CT-4 hasn't gone Republican recently. Now that Shays is out, it should be dark blue along with the rest of New England. Unless some red leeched from Scott Garrett's North Jersey district (the 5th). I don't know what the deal with that one was. Very messy clean up, though. In any event, it is fixed. I'm so sorry to keep going on. I promise I won't look at the map again. I feel like I'm being obnoxiously critical, but you seem to want to fix all of these little things. It's great that you put in the effort to fix these things - this attention to detail makes FHQ what it is. Just in the western corner of NM-1 you left a tiny bit of dark red. Not at all your fault; districts are gerrymandered to the point where, scaled down, a computer program could interpret them as noncontiguous. Ha! Funny you should mention attention to detail. I noticed that spot earlier and didn't really want to mess with it. But it should be fixed now. This map template really wasn't ideal, but it was the best I could come up with (...which wasn't all that bad). Why is Louise Slaughter's NY-28 on the list of split districts (it's correctly dark blue on the map)? Slaugther is a Democrat, and Obama won her district with 69% of the vote. Should have been NY-29. Cut and pasted the wrong one it looks like. In any event, it's fixed. This map is telling because we see the clear geographic split between the two parties: the democratic party having locked up the NE and the entire west coast, also the border to Mexico, and (by population, not be geographical size) the majority of the midwest. The GOP still dominates in the deep south and still has the VR advantage in the mountain west. I would love to see this breakdown of the 2000 and the 2004 elections. Lecturer in the Department of Public and International Affairs at the University of North Carolina -- Wilmington who specializes in campaigns and elections. I'll Admit It. CQ's Got Me on This One. Now Why Didn't They Just Do This Last Week? Research on polling place lines and dynamics in PRQ!